I know it’s been a while since my last kitchen reno update but I promise you we’ve been busy working away. I wanted to wait until I had enough to share before I did another update. 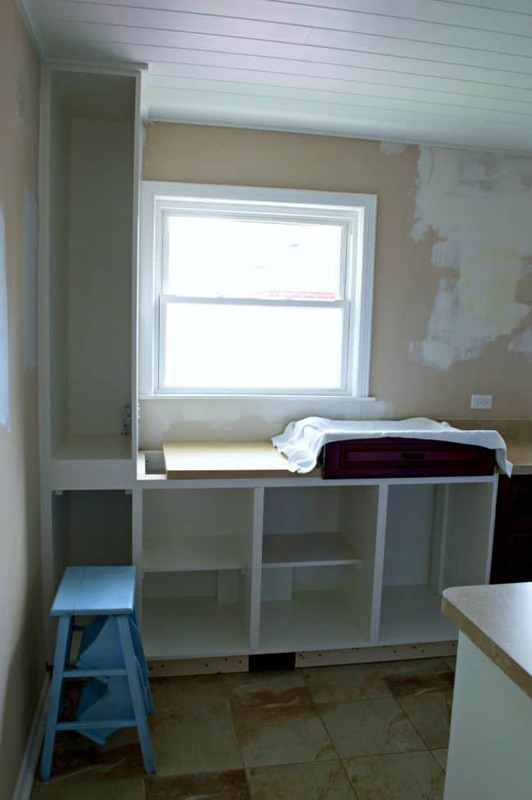 If you want to read about all the projects that we’ve done in the kitchen, go to the sidebar and click on Check out our kitchen reno posts. Are you ready to see what we’ve been up to? The last time I posted about the kitchen, we had just finished building the shell for our new cabinets. 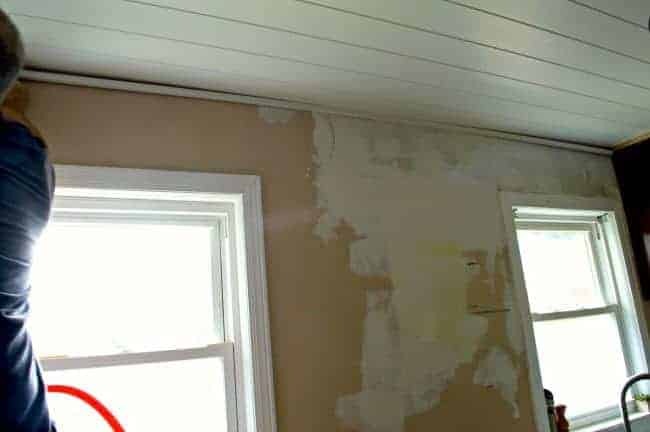 Since then we’ve been busy caulking, sanding, priming and painting this beast, and it just might be the worst job in this whole reno. It has to get done though, so we’re pushing through (while the Mr. grumbles the whole way). 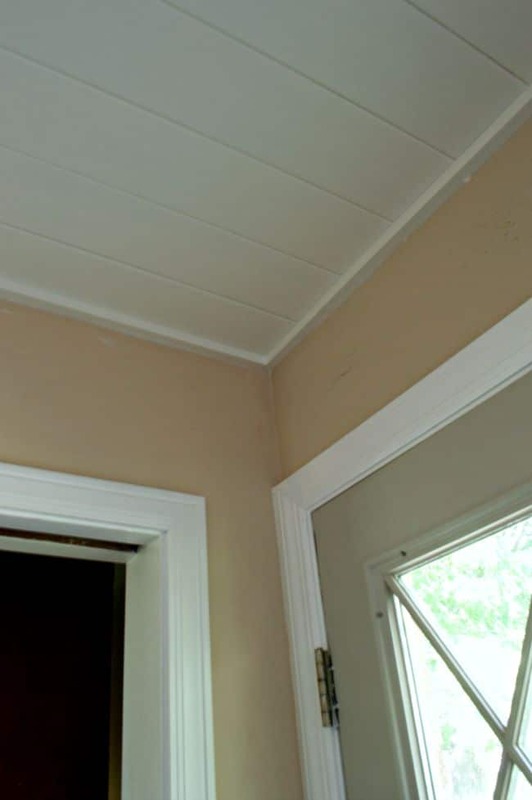 We’ve also cut, primed, painted and installed the molding that goes around the tongue and groove ceiling. We debated for a while on what we were going to use but, in the end, we went with something simple and not too chunky. It’s really only there to neatly finish off the ceiling. I know that I haven’t shared a whole lot of the details about what we were going to do but I’ll share some today. The window wall, that you see in the pic above, will be completely tiled from countertop to the ceiling molding we just installed. We will also have 2 barn wood shelves between the windows to house our every day dishes (plates, glasses, etc). There was a cabinet in that empty spot when we started but that has been eliminated completely. The lone ceiling light that we have up won’t be staying. I’m having a hard time right now finding a light that I like for this spot, they are either too big or too small. As a matter of fact, there are 3 new light fixtures sitting on my counter, right at this moment, mocking me. We still have to install the recessed lights so the placement of those are a factor in my decision. That’s it for now. 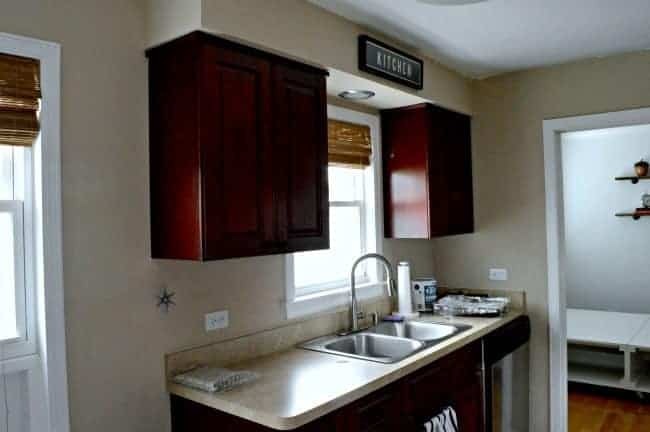 Besides installing the recessed lights and finishing the painting of the cabinets, we have to make a decision on the countertops, we need to purchase a sink and install the tile backsplash. We recently went shopping and purchased our tile (yay! ), more of that and some countertop choices in the next update. 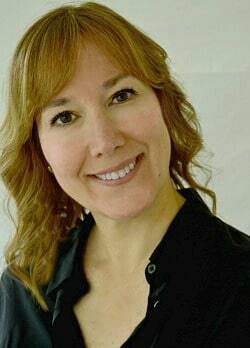 Thanks for sticking with me through this process and for reading and commenting on my reno updates. It has really helped me get through these long months. 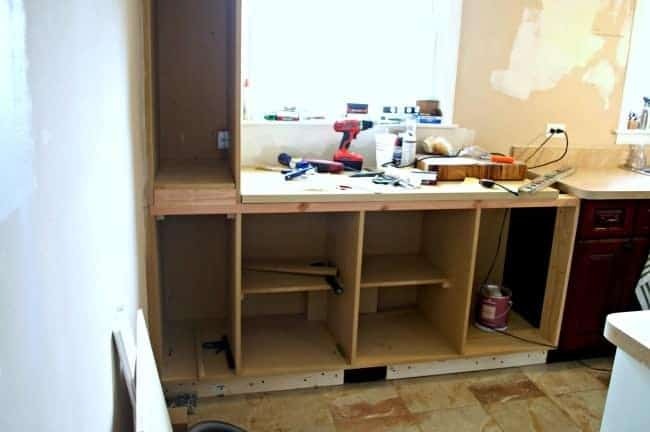 Your making good progress and kitchens are the hardest projects. 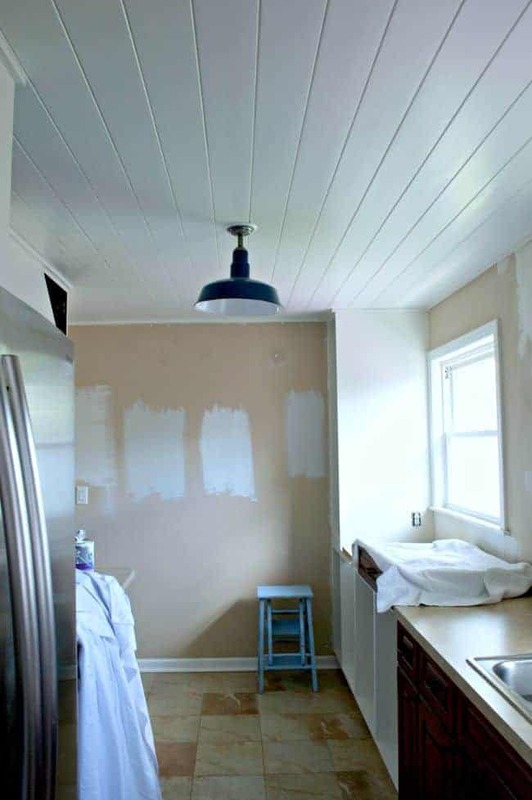 Love your ceiling…It will be all worth it when it’s done…just hard to get through. Hope you find your dream vintage trailer soon..but I’m learning quickly they are a money pit! Thanks for the words of encouragement Cathy. I’m ready for it to be over. Still looking for a trailer but, you’re right, fixing up a vintage one is costly and a lot of work. She’ll be a beauty when you’re done though. It’s coming along Kristi! Can’t wait to see more. I’ve made a few changes in my bathroom redo. I think I would have to show you instead of listing it here. Getting near the finish here too. 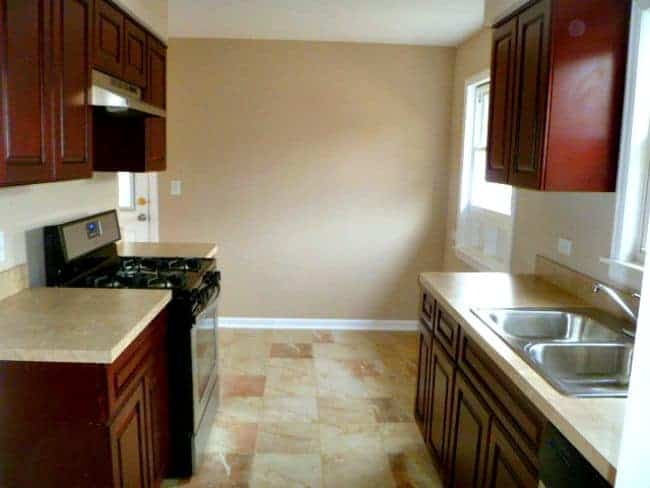 I’ll have to order my floor because “The Home Depot” doesn’t have the color I want in stock. I’m off next week again! Yay! Will be doing some yard work this time and a little in the bathroom. Thanks MJ. Looking forward to your finished bathroom photos. Hope you have a great week off! Oh I cannot wait to see all that tile!